Johnakan Ur-El: I will be very brief, because later on I want to leave a way to Ron... The pyramids of Egypt were not made by Egyptians.... And here there is a preposterous situation, because it is inexplicable how terrestrial scientists that are transcribing the hieroglyphics of Tar don't realize that there are no construction drawings, no words in the Egyptian old language or in the complicated hieroglyphics where the pyramids could be described. Interlocutor: Very well, the pyramids were made by extraterrestrials then , but in which date were they built? Johnakan Ur-El: At least 3000 years before the time they said they were built, that is to say 6000 years before I embodied as John Zebedee. It is very simple. Now they have the carbon 14, they have the cesium 12 ... why don't they make a confirmation with the stones? surely they will find that it has much more antiquity than the 3000 years they deemed. Interlocutor: And what was the purpose of the pyramids? Johnakan Ur-El: In that time and leaving aside all speculation about the ego of their builders could have had when they built them, the pyramids were teletransporting machines. The pyramids had tunnels that transported them to other worlds. Interlocutor: And how did they lift so tremendous weights? Johnakan Ur-El: In all the pyramids there were cavities, in some of them more than the others, these cavities were capable to contain an arrival station and a departure station. Interlocutor: Making a digression although important, Did UFOS come from the future or only time travelers? Johnakan Ur-El: None of the two alternatives is real. 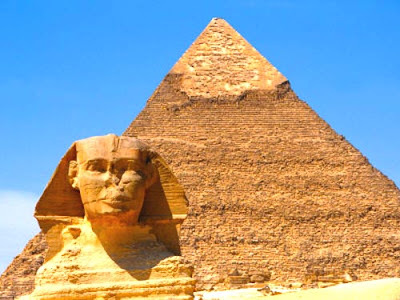 The Sphinx was simply built in that way so that the prehistoric inhabitants of that region took the pyramidal constructions as sacred objects more than machines so that they worship them and not discover what the pyramids had inside. Interlocutor: Were the Egyptians already in the region during that time? Interlocutor: But were they natives or they were brought to our planet? Johnakan Ur-El: No, they were not brought... they were directly terrestrial inhabitants who were developing their knowledge gradually, because more than once it has been transmitted that Before Tar, there were other extraterrestrial entities that transmitted knowledge to them. Interlocutor: To conclude the topic of the pyramids, I have two more questions: Do these pyramids at the moment have some purpose? And What relationship do they have with time travelers? Johnakan Ur-El: The pyramids have no longer use and they don’t have connections with time traveling. Interlocutor: But the researchers have established that the Great Pyramid indicates future events and that many have been fulfilled! Johnakan Ur-El: They are merely coincidences. We know that 99% of the prophecies are coincidental, and a tiny percentage goes to the category of time traveling. Interlocutor: In one of the pyramids, I believe that in the pyramid of Keops, they found a stairway on the ceiling. As stairways are usually on the floor, the obvious question is: What is the reason of this unusual location since at first sight it would seem absurd. Johnakan Ur-El: It would be absurd if there wasn’t anti-gravity. But the extraterrestrial entities who traveled until here, they had anti-gravitational artifacts and they could walk as if gravity wouldn’t exist in that place. I leave all my Light to you and my blessings. This entry was posted at Tuesday, July 28, 2009 and is filed under Mysteries and Enigmas . You can follow any responses to this entry through the .